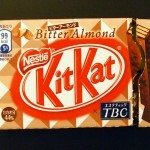 Review: Kit Kat Bitter Almond | Oyatsu Break! 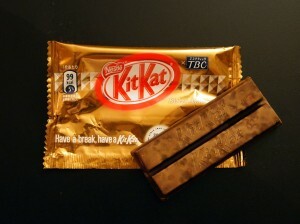 This Kit Kat came to me at a bit of a dryspell for new Kit Kats. It was in stores while I was in Japan in October 2010, and then remained in stores both locally and online forever. 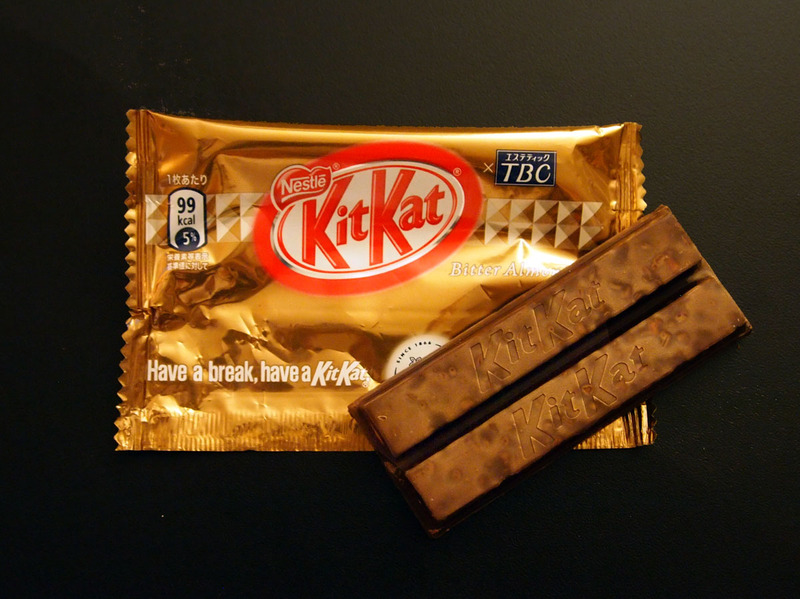 As it became more and more clear that I wasn’t going to be able to go back to Japan in early 2011, I grew frustrated with the fact that, alongside Adult Dark, this Kit Kat lingered on store shelves seemingly indefinitely, with no new flavours to come. 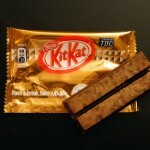 While other Kit Kat blogs have talked about flavours like Hazelnut Strawberry and Cookies and Cream and Tiramasu, visits to the shop were greeted with… Adult Dark and Bitter Almond. And Adult Dark. And Bitter Almond. I’m trying not to be as bitter as the bar in reviewing them, but I can’t promise anything. 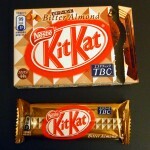 Packaging: I actually really love the packaging for Bitter Almond Kit Kat. 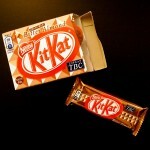 The exterior box, with the 3d inspired triangles and the large picture of the Kit Kat Finger is really cool. Coupled with large romanji writing and photos/illustrations of almonds, all in a lovely bronze colour, and I feel it’s a hig. Things get even better once you open the package; the shiny bronze foil with repeating triangle motif is eyecatching, but still a little understated. It feels a little bit special, and that’s what you want out of a snack. Scent: Right out of the package there’s a strong, bitter dark chocolate scent. Even past the best before, it’s a very strong scent and actually kind of pleasant. 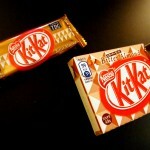 It seems like they’re using the same dark chocolate as on the adult bars, instead of the standard milk chocolate. I can’t really smell much that could be considered ‘almond’ though. Taste and Texture: Again, the matte finish of the dark chocolate bars is considerably less appealing than the shiny candy-chocolate coating on their usual bars. I suppose it’s a way of visually denoting the difference amongst consumers, but ultimate I’m not sure if I like it. Man, I’m sitting here with the bar about 2 feet away and it is so powerful I can smell it from here. Crazy. The most immediate flavour is of the dark chocolate. 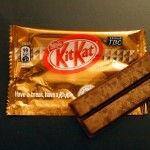 It’s considerably less sweet than a standard-issue Kit Kat, though it isn’t so dark or bitter than you forget it’s a Kit Kat candy bar. I actually didn’t get any of the almond at first, and it was only as I finished chewing the finger that I noticed a sort of all-over mouth taste of almond. It comes through only in the full-mouth flavour though. If I could be so bold as to make a suggestion, a Kit Kat with actual pieces of Almond in it–like any of the Pocky’s with nuts on them–might be a better way to go. Verdict: Ultimately, it tastes like what it says on the package. It’s nice in its way, although stronger tastes, richer tastes, would be preferable. It’s worth trying but it certainly wasn’t worth being the only thing on store shelves for weeks and months at a time.